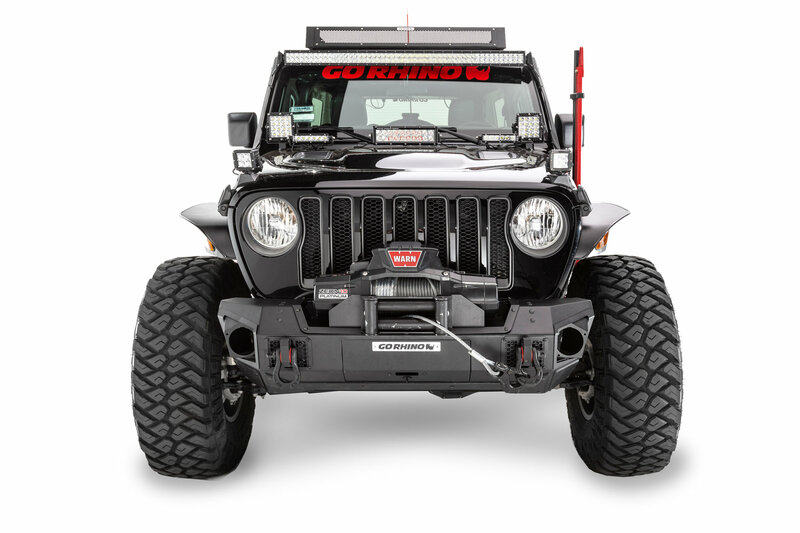 Get the ultimate in off-road bumpers for your Wrangler JK with Go Rhino's Trailline Winch Ready Front Stubby Bumper. This bumper allows you to run larger tires to help out on the trails as well as accepts up to a 12000lb winch. The rhino hook shackles give you additional recovery points and the front gear drawer makes a great place to store tow straps for easy convince when you need them to get out of a jam. Construction: Made from CNC laser cut & formed steel that has fully welded hand finished seams gives you a clean looking sturdy bumper to protect your Jeep. Design: Stubby bumper giving you extra clearance to run larger tires as well as having better approach angles for whatever obstacle you come across on your trail rides. Welded 1" thick rhino hooks that hold up to 7/8" d-rings giving you more recovery points incase you or your friends get stuck. A front gear drawer to store off-road gear in for whenever you need it. Installation: No drilling or modifications are required for this bumper to fit on a Wrangler JK. You might need to make some minor modifications for it to fit on a Wrangler JL.